For centuries, men have worn cloth around their necks. This has been just as much for decorative purposes as it has been for utilitarian ones. Still, there is much confusion around the how to properly dress the neck, not to mention next to zero standardization with regard to terminology. What kind of neckties should I wear? Will I look ridiculous in a bow tie? How the hell am I supposed to tie a scarf, anyway? Does anyone even wear ascots nowadays? And what on God’s green Earth is a neckerchief? We seek to answer these questions (and more) in our Ultimate To Neckwear. Far and away the most common style of neckwear for men, the necktie is also known as a four-in-hand (which is also the name of a common knot in which this tie is tied). Able to be tied in a multitude of ways, neckties are appropriate for any situation excluding business casual and black or white tie dress codes. Perceived as either dapper or nerdy, bow ties go through periods of popularity and disdain. Regardless of the whims of fashion, we feel that there’s always a place for the bow tie in the well-dressed man’s wardrobe, so long as you tie it yourself. Bow ties can be worn casually with odd jackets and trousers, and they must be worn with a tuxedo or full dress clothes. Men have been wearing scarves since time immemorial. Though most of us stick to wearing cashmere or merino wool scarves in winter, silk scarves will give you warmth with some added “oomph” to an outfit. Neckerchiefs (silk scarves tied kind of like ascots) haven’t been popular amongst the masses for many tears now, but that’s no reason to avoid wearing them. More on this below, but the definition of the word”cravat” is any article of clothing intended to be worn around the neck. 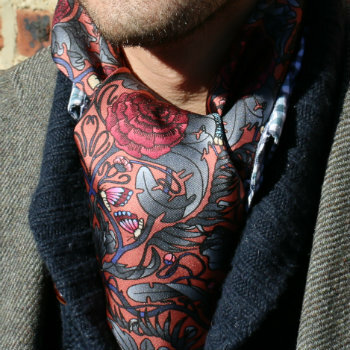 The British use “cravat” to refer to ascots and “day cravat” to refer to neckerchiefs. 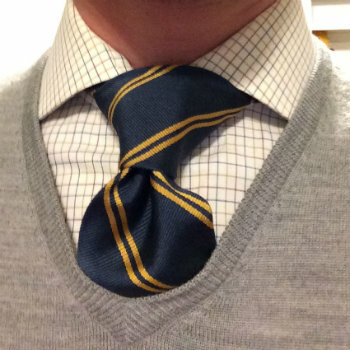 If it refers to any one unique style of neckwear, it would be a rouche or scrunch tie. An ascot is technically a type of necktie, and it also happens to be the most formal one. True ascots are only worn with morning dress; they are secured to the shirt front with a tie tack after being tied in a simple knot. Largely a relic of the past on par with opera pumps, ascots have mostly been replaced with simple silk neckties for daytime formal attire. If we learned anything during our research, it’s that there is next to zero standardization around the terms used to describe neckwear items. Terminology for neckties, bow ties, and scarves is rather straightforward. The issue is around the words ascot and cravat, and we need to clear this up. Ascots are a formal daytime necktie. They are worn with morning suits and rest on top of the shirt. 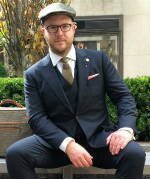 In the States especially, the word “ascot” is erroneously used to refer to a neckerchief, which is essentially a fancy silk scarf tied loosely around the neck as an ascot would be and tucked into the shirt. Cravat is a catch-all term for neckwear. The British often use the word to refer to both ascots (sometimes referred to as a “formal cravat”) and neckerchiefs (often referred to as a “day cravat”). Generally speaking, the term “cravat” is used to refer to neckwear that is neither a bow tie, necktie, or an outerwear scarf (that is, one whose main purpose is warmth). We make an exception for the French on this one, whose word for necktie is, in fact, cravate. In summation, Americans refer to ascots and neckerchiefs as “ascots,” the British refer to both as “cravats,” and the French do their own thing. You may be familiar with the French word cravate and its English equivalent, “cravat.” This is where the story of the modern necktie begins. Modern neckwear, like so many of the garments we don every day, has a military origin. In the 1630’s, France’s King Louis XIII was at war with The Duke of Guise and Marie de’ Medici. King Louis enlisted a regiment of Croatian mercenaries to aid in his military efforts. Interestingly, these Croatians wore ornate, knotted scarves around their necks. Enlisted soldiers wore coarse, though cloths, while officers wore more delicate, silken or linen ones. At any rate, the French word for Croatian is Croate. It isn’t a huge leap to see that cravate is a corruption of this word, as the pronunciations are quite similar. In a nutshell, this neckwear was named “cravat” due to a widespread mispronunciation. The French adopted the cravat into their everyday wear years later. Given the increasing interdependence of Europe at the time, the garment made its rounds to other locations in the world. Beau Brummel, the famous British dandy who ushered in minimalism, simplicity, and use of dark colors that we still use today in modern dress, was known for wearing a starched white neckcloth in the early 19th century. Our neckwear -ties in particular- is derivative of that neckcloth. Outfits were not complete without such a neckcloth in his time, and one can argue that an outfit is incomplete without a tie in ours. While we don’t wrap our necks in linen to protect ourselves in battle anymore, we do wrap our necks in silk to keep warm, go to work, or just make a positive impression on those around us. Even for those unfortunate chaps who don’t dress well can garner some extra credit for throwing on a tie. A slob in a tie is better than a slob in a t-shirt. 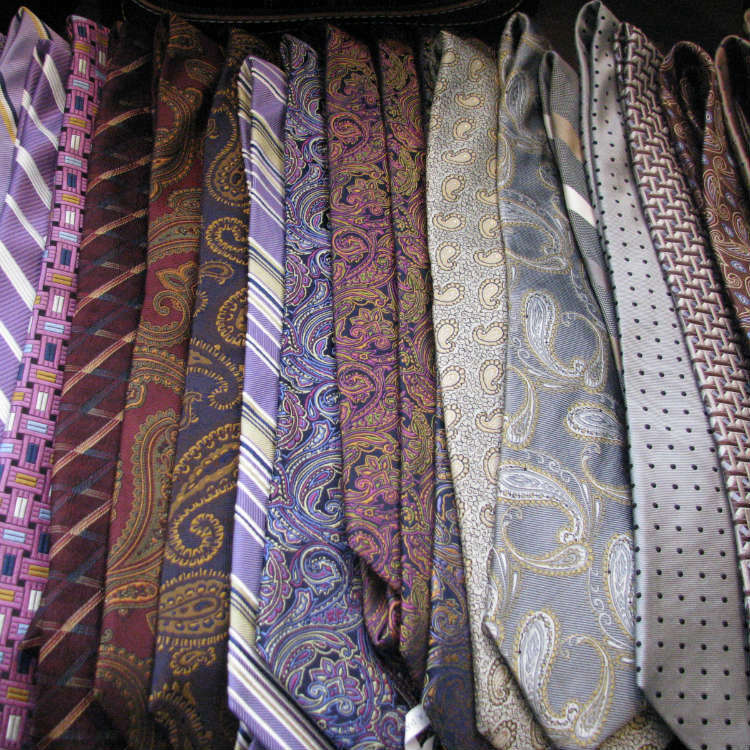 There’s still a market for neckties in the workplace, though it’s still recovering from the dreadful dress-down 1990’s. Bow ties still retain a bit of professorial nerdiness but have seen a resurgence as men became more style-conscious in the 2010’s. Scarves, of course, are much more utilitarian than any kind of tie and thus have a place in every man’s closet, regardless of his own personal level of style. Ascots seem to be solely for dandies, though we certainly encourage you to try one out. Why Do We Still Wear Ties? Ties and even some scarves do none of these things. They are entirely superfluous outside of their role as aesthetically pleasing. Centuries ago, wearing silk about the neck that served no utilitarian purpose was an indicator of wealth, just as starched white collars were. So why do we continue to wear them? Ties are the lynchpin of the tailored ensemble. A suit is not quite a suit without one, and they serve to dress up more casual outfits. 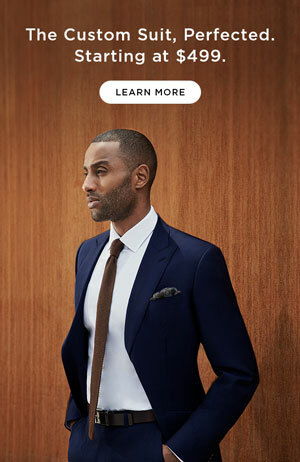 Our argument is that so long as tailored clothing is around, ties will be with us too. On the flip side of that, should tailored clothing ever be phased out of our sartorial lexicon (and Heaven forbid that it doesn’t), the tie will likely go with it. Though we live in a more casually dressed world than almost any generation before us, what we wear around our necks is still important. Indeed, as men have moved away from ties, those who choose to wear them set themselves apart even further. We encourage you to be one of those men, and it’s our hope that the guides we’ve created put you on solid footing to do so. Jabot. This article didn’t mention the Jabot. I’m more inclined to wear a jabot. Jabot? I’m sorry we didn’t mention the jabot. Since you mentioned jabots no less than three times, are you a jabot kinda guy?